Ryanair is Europe’s Number 1 airline, carrying over 142m customers p.a. 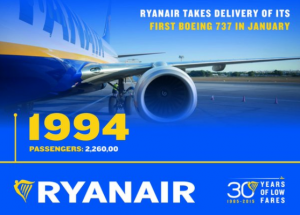 on more than 2,000 daily flights from 84 bases, connecting 226 destinations in 37 countries on a fleet of over 455 Boeing 737 aircraft, with a further 210 Boeing 737’s on order, which will enable Ryanair to lower fares and grow traffic to 200m customers p.a. by FY24. Ryanair has a team of more than 14,500 highly skilled aviation professionals delivering Europe’s No.1 on-time performance, and an industry leading 34-year safety record. In 2017, Ryanair became the first European airline to have carried over 1 billion customers. We rolled out Year 4 of our “Always Getting Better” programme, which included connecting flights via Rome, Milan & Porto, reduced check-in bag fees, an exclusive partnership with the Erasmus Student Network, and a new Ryanair Rooms website and App. MyRyanair grew to over 30m members and Ryanair.com became the world’s most visited airline website. We grew to 87 bases, as we opened Memmingen, Poznan and Burgas (from March ’18), and also added Munich, Rimini, Varna & Aalborg to our ever-expanding list of airports. Our traffic grew by 13% to 120m customers while our average fare fell to €41, on a 94% load factor. We rolled out Year 3 of our “Always Getting Better” programme, which included improvements to our app (the No. 1 downloaded airline app), improved Flexi-Plus and Leisure-Plus products, Schools Travel and Groups websites, and “Rate My Flight”. We announced the launch of Ryanair Sun, a charter airline with a Polish AOC to begin operations in Summer 2018. We launched 10 new bases at primary airports in Bucharest, Corfu, Frankfurt Main, Hamburg, Ibiza, Nuremburg, Prague, Sofia, Timisoara and Vilnius and announced full year net profit of €1.316bn, an increase of 6% on the previous year. Our traffic grew by 18% to 106.4m customers while our average fare fell to €46, load a 93% load factor – and still with no fuel surcharges. We rolled out Year 2 of our “Always Getting Better” programme with a dedicated USA website, the unveiling of our new Always Getting Better customer charter, a new Ryanair Car Hire service, new cabin interiors with slimline seats, new crew uniforms, and improved inflight menus. Our brand new personalised website included an improved “My Ryanair” customer registration system allowing even faster bookings and tailored offerings. We launched 7 new bases in Belfast, Berlin, Corfu, Gothenburg, Ibiza, Milan Malpensa and announced full year net profit of €1.24bn, an increase of 43% on the previous year and became the first airline to carry 100m international passengers in one year, as we celebrated 30 Years of Low Fares since our first flight in 1985. Our traffic grew by 11% to 90.6m customers with our average fare of just €47 and no fuel surcharges. We relentlessly improved our lowest fare/lowest cost model, expanded into primary airports and added business schedules and launched our “Always Getting Better” programme. We placed firm orders for 183 B737-800S and 200 B737 Max 200s (including 100 options). We opened new bases in Bratislava, Cologne, Gdansk, Glasgow and Warsaw. We returned to GDS distribution with Travelport, Amadeus and Sabre and announced full year net profit of €867m, an increase of 66% on the previous year. Our traffic grew by 3% to 81.7m customers with our average fare of just €46 and no fuel surcharges, despite another steep increase in fuel costs. We placed firm orders with Boeing for 175 new aircraft. We opened 4 new bases at Athens, Brussels, Lisbon and Rome and announced 3 new bases for winter 2014 in Cologne, Gdansk, and Warsaw, as we grew to 68 bases and over 1,600 routes. We announced full year net profit of €523m, slightly ahead of previous guidance, and the €100,000 proceeds from our world famous Cabin Crew Charity Calendar (2014) went to the Teenage Cancer Trust (UK). Our traffic grew by 5% to 79.3m passengers with our average fare of just €48 and no fuel surcharges, despite another steep increase in fuel costs. We took delivery of a further 15 new aircraft to bring our fleet to 305 Boeing 737-800s and placed firm orders with Boeing for 175 new aircraft. We opened 7 new bases at Chania, Eindhoven, Fez, Krakow, Maastricht, Marrakech and Zadar, as we grew to 57 bases and over 1,600 routes. Our profits rose 13% to a record €569m despite higher oil prices and the €100,000 proceeds from our world famous Cabin Crew Charity Calendar (2013) went to the TVN Foundation in Poland. Our traffic grew by 5% to 75.8m passengers with our average fare of just €45 and no fuel surcharges, despite a sharp increase in fuel costs. We took delivery of a further 25 new aircraft as our fleet rose to 294 Boeing 737-800s. We opened 6 new bases at Baden, Billund, Budapest, Paphos, Palma De Mallorca and Wroclaw, as we grew to 50 bases and over 1,500 routes. Our profits rose 25% to a record €503m despite higher oil prices and the global recession and we announced a planned €483m special dividend to shareholders. Once again, we launched our World famous Cabin Crew Charity Calendar (2012) which this time raised over €100,000 for the Irish charity DEBRA Ireland. Our traffic grew by 8% to 72.1m passengers with our average fare at just €39 and no fuel surcharges, despite a sharp increase in fuel costs. We took delivery of a further 40 new aircraft as our fleet rose to 272 Boeing 737-800. We opened 8 new bases in Barcelona El Prat, Gran Canaria, Kaunas, Lanzarote, Malta, Seville, Tenerife and Valencia as we grew to 44 bases and over 1,300 routes. Our profits rose 26% to over €401m despite higher oil prices, the global recession, and volcanic ash disruptions in the spring. Finally we launched our World famous Cabin Crew Charity Calendar (2011) which raised over €100,000 for the German charity ‘Tafel’. Our traffic grew by 14% to 66.5m passengers as our average fare was reduced to just €35. We took delivery of a further 51 new aircraft as our fleet rose to 232 Boeing 737-800. We opened 8 new bases in Bari, Brindisi, Faro, Leeds Bradford, Oslo Rygge, Pescara, Porto and Trapani as we grew to 41 bases and over 940 routes. Our profits rose 200% to over €318m while traffic growth continues during a global recession which saw many of our competitors announce losses or cutbacks, and even more go bankrupt. Finally we launched our very popular Cabin Crew Charity Calendar (2010) wich raises over €100,000 which was donated to the ‘When You Wish Upon a Star’ Charity in the UK. Our traffic grew by 15% to 59m passengers. During this year we take delivery of 18 new aircraft bringing our entire fleet to 181 Boeing 737-800 NG aircraft. We open 223 new routes and 4 new bases (Alghero, Bologna, Cagliari and Edinburgh). We welcome the UK Competition Commission’s findings that the BAA airport monopoly in the UK is affecting competition adversely. We achieve a milestone victory when the European Court of First Instance dismissed the EU Commissions 2004 Charleroi decision and ruled that Ryanair’s 2001 base agreement in Charleroi complied with state aid rules and did not comprise of either state aid or subsidy. This is a historic victory for Ryanair, for consumers and for hundreds of Europe’s regional airports who are now free to grow and develop their traffic. The average employment numbers in Ryanair rise by 21% to 6,369. Within that number 1,526 people are promoted. We launch our second Cabin Crew Charity Calendar (2009) with the €100,000 going to the homeless charity ‘The Dublin Simon Community’. Traffic grows by 20% to 51m passengers , we take delivery of 30 new aircraft to operate a fleet of 163 Boeing 737-800 Next Generation aircraft. We open 201 new routes and 3 new UK bases: Bournemouth, Birmingham and Belfast. 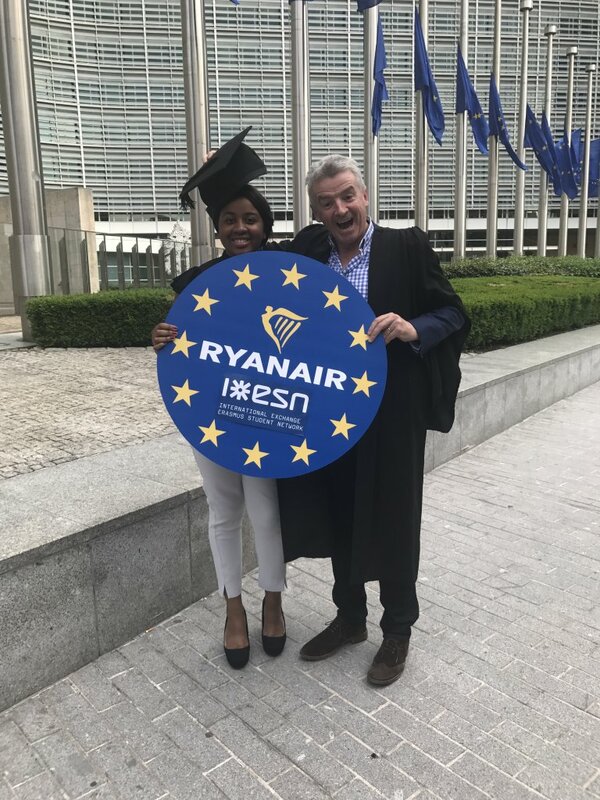 This year Ryanair creates 1400 new jobs with 23% of our staff being promoted as our continuing growth creates new opportunities for career development. Our people deliver industry leading productivity with Ryanair carrying almost 10,000 passengers per employee, which is ten times better than our principal competitors. In December we raise €70,000 for children’s charity ‘Angels Quest’ in Ireland. We carry a record 42.5 million passengers in the year. In March we accept delivery of our 100th Boeing 737-800 and launch our Web check-in service, giving passengers the opportunity to check-in online across our entire route network. Over the summer, Ryanair becomes the world’s first airline to carry more than 4 million international passengers in one month. We also become the first airline to announce plans for onboard mobile phone use across our entire fleet and we announce a new base in Bremen. In October Ryanair gaming and bingo is launched and we make an all cash offer for the small regional airline, Aer Lingus while November sees the opening of new bases in Madrid in Marseille. While other airlines maintain their fuel surcharges, Ryanair remains the only airline to guarantee “no fuel surcharges ever” prompting even more passengers to flock to our lowest fares and best customer service on 436 low fare routes across 24 countries. We launch 5 new bases, at Liverpool John Lennon Airport, Shannon in the West of Ireland, Pisa, Nottingham East Midlands and Cork, giving us a total of 15 bases throughout Europe in 2005. We retire the remaining 737-200 aircraft and replace them with brand new Boeing 737-800s. We now have the youngest fleet in the world with an average aircraft age of just two years. Our punctuality is also second to none, and we celebrate beating Easyjet for punctuality every week for three years solid. We carry more passengers in August than British Airways on their entire worldwide network, making us “The World’s Favourite Airline.” We also reiterate our “no fuel surcharge guarantee” as airlines such as British Airways, Air France and Lufthansa continue to supplement their already high fares with fuel surcharges. To celebrate our 20 th birthday, we offer 100,000 seats at 99p, 100 times less than our 1985 fare!. Ryanair is named the most popular airline on the web for 2003 by Google, as www.ryanair.com continues to be the most searched travel website in Europe. We add 24 new B737-800 aircraft (60 in total) and retire another 5 of the older 737-200s. We launch two new bases in Rome Ciampino and Barcelona Girona as well as adding further aircraft to the existing bases at Stockholm Skavsta, Frankfurt Hahn and Milan Bergamo. Ryanair.com now accounts for over 98% of all Ryanair bookings. Rapid expansion of Ryanair right across Europe continues. We acquire Buzz, the Stansted based loss making airline from KLM in April, we close it for a month and then re-launch on 13 former Buzz routes in May at half the fares previously charged by Buzz. 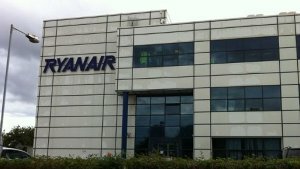 This acquisition gives Ryanair immediate access to 11 new French regional airports as well as making Ryanair by far and away the largest airline operating at London Stansted Airport. We also open up two new Continental European bases with the launch of low fare flights from Milan Bergamo in February and from Stockholm Skavsta in April. In total this year we launch 73 new routes, we take delivery of 14 more B737-800s (42 in total) and retire the first 7 of our 21 older B737-200s at the end of the year. We carry over 2m. passengers in one month (July) for the first time. We select Frankfurt Hahn as our second Continental European base and launch in April with 10 routes to Ireland, UK, Norway, France and Italy. These first low fare flights to Germany bring an end to the high fare monopoly of Lufthansa. Ryanair successfully overturns Lufthansa’s repeated attempts to block low fare competition from Ryanair in Frankfurt Hahn in the Germany Courts. German consumers flock in their millions to avail of the lowest air fares to and from Frankfurt. To accommodate this growth, Ryanair announces the largest ever aircraft order by an Irish airline by increasing our aircraft order with Boeing from 45 to 125 firm aircraft, with a further 125 options. The value of this order exceeds €6bn. and signals Ryanair’s ambition to continue to be the largest low fares airline in Europe as well as the lowest fare airline in Europe. Ryanair becomes No.1 in Europe of customer service beating all other European airlines for punctuality, fewer cancellations and least lost bags. 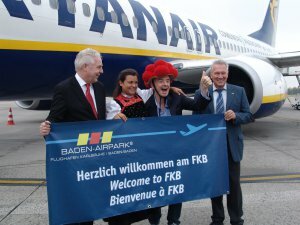 Ryanair selects its first Continental European base at Brussels Charleroi Airport with 5 more B737-800s (18 in total) being delivered. All of our competitors, including Sabena and Brussels Zavantem Airport, predict that nobody will use Brussels Charleroi, and that Ryanair’s low fares will never work in Brussels. We start with daily flights from Brussels to Dublin, London, Glasgow, Shannon, Venice, Paris and Carcassone. We commence our first day flights with our famous “Mannikin Pis” advert which drives Sabena crazy and convinces Belgium that Ryanair’s low fares and Brussels Charleroi are here to stay. In August we carried more than 1m passengers in one month for the first time. This is more traffic in one month than we carried in all of 1993! In September, the terrorist attacks on 9/11 mark a downturn in our traffic and cause enormous increases in oil prices. In January, Ryanair launches Europe’s largest booking website – www.ryanair.com. Within three months the site is taking over 50,000 bookings a week, and becomes the only source of the lowest airfares in Europe. 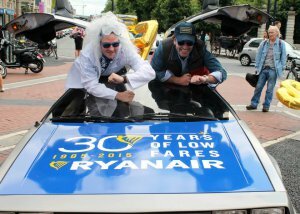 In addition, ryanair.com allows passengers to avail of the lowest cost car hire, hotel accommodation, travel insurance and rail services. 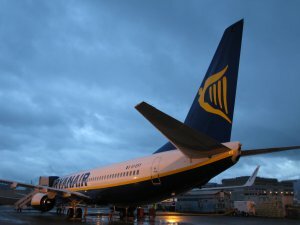 Ryanair adds 8 more B737-800s (13 in total) and launches its first new base since 1991 by basing three new aircraft at Glasgow Prestwick, providing Scottish consumers for the first time with direct low fare flights to Europe (Paris and Frankfurt), in addition to low fares flights to Dublin and London. One of our cabin crew, Brian Dowling, wins the Big Brother reality TV show. Ryanair becomes the first airline to sponsor the Skynews Weather reports, which beams Ryanair into millions of homes and thousands of hotel rooms all over Europe. On 20th March Ryanair accepts delivery of its first new Boeing 737-800 series aircraft. Five in total are delivered during the year. The aircraft begins operations from our main base at London Stansted, and its impact allows Ryanair to operate with significantly lower seat costs and to offer much lower airfares, but with better reliability and a fantastic new customer product. New European routes are launched to Frankfurt, Biarritz, Ostend, Ancona, Genoa, Turin, Derry and Aarhus in Denmark. Ryanair is awarded “Best Value Airline” by the UK “Which” Consumer Magazine. Duty free sales on internal EU flights and travel are brought to an end. We respond by introducing a lowest ever return fare of £19.99 on the Dublin-London route. Ryanair continues to open up new routes in Europe. The 1998 summer schedule sees six new destinations added in Malmo (Sweden), St Etienne and Carcassonne (France) and Venice, Pisa and Rimini in Italy. 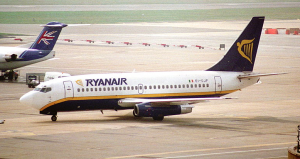 In order to accommodate our continuing rapid growth, on 9th March 1998 Ryanair places an order for 45 (25 firm and 20 options) brand new Boeing 737-800 series aircraft with a value of over $2bn. In July, we issue new shares to raise over £110m to help pay for these aircraft. Ryanair is voted ‘Airline of the Year’ by the Irish Air Transport Users Committee, and is voted the ‘Best Managed National Airline’ in the world by the prestigious International Aviation Week magazine. Ryanair launches its first four European routes with services from London Stansted to Stockholm Skavsta and Oslo Torp, and with low fare flights from Dublin to Paris Beauvais and Brussels Charleroi. We buy 2 more B737s (from TAP and GECAS) to bring the fleet to 21 aircraft. 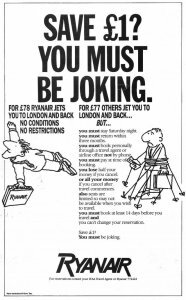 On 29th May 1997 Ryanair becomes a public company for the first time with a successful flotation on the Dublin and NASDAQ (New York) Stock Exchanges. The shares are more than 20 times over subscribed and the share price surges from a flotation price of €11 to close at €25.5 on their first day of trading. All of Ryanair’s employees receive shares as part of the flotation process and at the close of the first days trading, Ryanair’s employees are sitting on over €100m. worth of shares. In October we launch our third airport base at Glasgow Prestwick with daily flights to Dublin, London, Paris and Frankfurt. In December the UK Civil Aviation Authority publishes punctuality statistics for the Dublin-London route which confirms that Ryanair is the most on-time airline on the route for 1997. Ryanair’s growth continues with new routes to Leeds Bradford, Cardiff and Bournemouth in April. 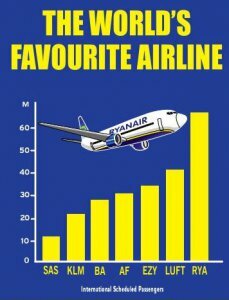 Ryanair is voted Best Value Airline. In November we reach agreement to buy 8 more Boeing 737-200s, which were previously operated by Lufthansa. We take delivery of the first of these in December, bringing the year end fleet to 12 x Boeing 737s. The European Union finally completes the “Open Skies” deregulation of the scheduled airline business thereby enabling airlines to compete freely throughout Europe. Ryanair overtakes Aer Lingus and British Airways to become the largest passenger airline on the Dublin-London route (the biggest international scheduled route in Europe). Ryanair also becomes the largest Irish airline on every route we operate to/from Dublin. It proves that Ryanair’s low fares, high frequency formula continues to win acceptance in every market we operate between Ireland and the UK. In September Ryanair becomes the first low fares airline to operate a domestic route in the UK with low fare flights from London Stansted to Glasgow Prestwick. Ryanair celebrates its 10th birthday with a big party in Lansdowne Rugby Club, but few people remember it!!! We buy 4 more Boeing 737s from Transavia bringing the fleet to 11 aircraft in 1995, and traffic for the year exceeds 2m. for the first time. Ryanair takes delivery of its first Boeing 737 in January and launches two new routes from Dublin to Manchester and Glasgow Prestwick in April. A total of 8 x 737s are delivered during the year and replace the old BAC 1-11s, the last of which are retired from the fleet at the year end. In October we start new services from Dublin to London Gatwick replacing Aer Lingus who have pulled off the route. Ryanair launches its first new route for 5 years with daily flights from Dublin to Birmingham. The Irish Government warn us not to do it because it will “upset” Aer Lingus. We go ahead anyway. We increase the fleet to 11 x BAC 1-11 jets by acquiring 4 ex-British Airways aircraft. In December Ryanair announces a deal to buy a fleet of six Boeing 737 aircraft direct from Boeing. 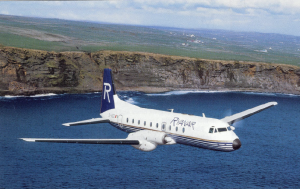 These aircraft were previously operated by the UK charter company Britannia, and allow Ryanair to start replacing the old BAC1-11 jets, all of which are scheduled for redelivery or retirement in 1994. Thanks to continuing growth, we carry over 1 million passengers in one year for the first time. Ryanair continues to restructure cutting back routes and fleet. The route network is shaved back from 19 to just 6 routes – Dublin-Stansted, Dublin-Luton, Dublin-Liverpool and Cork, Shannon and Knock to Stansted. We increase the jet fleet from 6 to 7 BAC 1-11s, increase frequencies and lower fares. Despite a reduction in routes, traffic grows by over 45% as passengers respond to Ryanair’s lower fares, and all jet, high frequency services. In August we carry over 100,000 passengers in one month for the first time in our history. The Gulf War breaks out in January causing passenger traffic to collapse. Tanks are stationed outside the major London airports. We respond by lowering air fares and we get rid of our turbo props by returning 3 x ATR 42s to their owners, a decision which results in our withdrawal from regional routes to Kerry, Galway and Waterford airports. 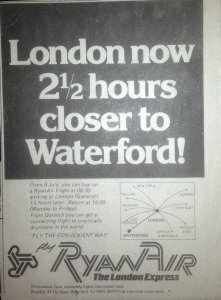 In May 1991, Ryanair switches its main London base from London Luton Airport to the new London Stansted Airport in Essex. Stansted was developed by the BAA to become the third main airport for London and has a fantastic new terminal and a direct rail link to the centre of London (Liverpool Street Station). This is the only time in Ryanair’s ten years of operation that traffic and employment numbers fall. Despite the impact of the Gulf War, Ryanair makes a profit for the first time with an audited profit of £293,000 for the year. After three years of rapid growth in aircraft, routes and intense price competition with Aer Lingus and British Airways, Ryanair accumulates £20m in losses and goes through a substantial restructuring. The Ryan family invest a further £20m. in the company, and copying the Southwest Airlines low fares model the airline is re-launched under new management as Europe’s first low fares airline. Ryanair now offers the lowest fares in every market, high frequency flights, moving to a single aircraft fleet type, scrapping free drinks and expensive meals on board but reducing the lowest fares from £99 to just £59 return. We launch an Easter weekend seat sale with fares of £59 return, and such is the demand that passengers queue halfway up Dawson Street for 3 days to get these lowest ever fares. We lease two more ATR42 turbo props (3 in total) and use these aircraft to retire the small Bandeirantes and the old 748’s. The fleet now comprises 6 x BAC1-11 jets and 3 x ATR42 turbo props. Due to continuing losses the business class product is abandoned and the Frequent Flyer Club closed. Ryanair leases another three BAC 1-11 jets (6 in total) from Tarom, and leases a brand new ATR 42 turbo prop aircraft from GPA to service the smaller Irish regional airports. We launch 2 new routes from Dublin to Brussels (Mon-Fri) and a once weekly to Munich. 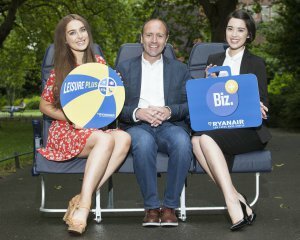 Ryanair launches a business class service and a Frequent Flyer Club, neither of which prove particularly successful. 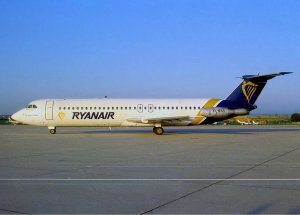 Ryanair acquires its first jet aircraft by leasing three BAC1-11 aircraft from the Romanian state airline, Tarom. The aircraft arrive on a full wet lease with Tarom providing all the pilots and engineers to enable Ryanair to operate the aircraft. With the arrival of these jet aircraft Ryanair increases its network with 15 scheduled routes from Dublin to Liverpool, Manchester, Glasgow and Cardiff, and opens up new routes from Luton to Cork, Shannon, Galway, Waterford and Knock in the West of Ireland. Ryanair obtains permission from the regulatory authorities to challenge the British Airways and Aer Lingus’ high fare duopoly on the Dublin-London route. Services are launched with two (46-seater) turbo prop BAE748 aircraft. The first flights operate in May from Dublin to London Luton. The launch fare of £99 return is less than half the price of the BA/Aer Lingus lowest return fare of £209. Both British Airways and Aer Lingus slash their high prices in response to Ryanair’s. 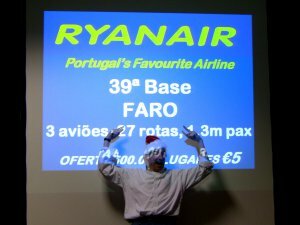 Ryanair starts the first fare war in Europe. With two routes in operation, Ryanair carries 82,000 passengers in its first full year in operation. Ryanair is set up by the Ryan family with a share capital of just £1, and a staff of 25. We launch our first route in July with daily flights on a 15-seater Bandeirante aircraft, operating daily from Waterford in the southeast of Ireland to London Gatwick. Ryanair’s first cabin crew recruits must be less than 5ft. 2ins. tall in order to be able to operate in the tiny cabin of the aircraft! !